The Golden State Warriors are the best team in the NBA. No one is arguing that. The Oklahoma City Thunder are the most-compelling. Hard to argue that, as well. 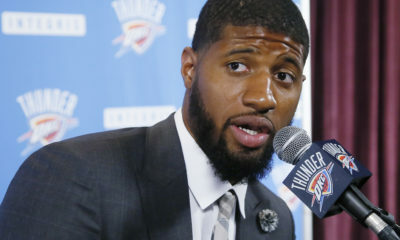 Credit the skills of Russell Westbrook, the social media skills of Kevin Durant, the beard of James Harden or maybe the dealings of general manager Sam Presti. Everyone is talking about the Thunder. It never stops. That’s impressive, especially in a league that features the Knicks and the Lakers. And on a sleepy Thursday in July, the Thunder are once again back in the news. 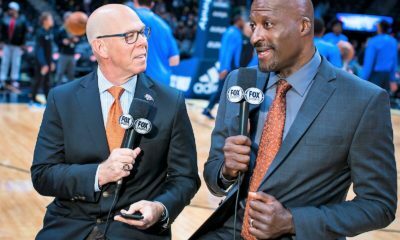 And once again, this team, this small-market team in flyover country USA, is the epicenter of NBA talk. 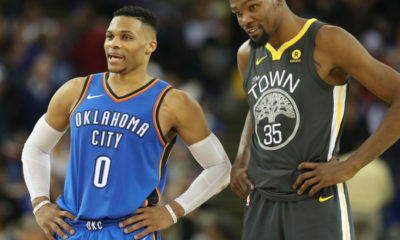 And in a league where the on-court mystery is an easy solve, the off-court banter and arguing will center around Oklahoma City again. Three MVPs, the circus coming to town with Carmelo Anthony, and now packing up and leaving, Thursday the Thunder shipped Anthony for Dennis Schroder and Timothe Luwawu-Cabarrot. Regardless of whether you think the Thunder are better, or got worse. Regardless of whether you think Golden State will win it all again, we’re lucky. The worst thing is to have an apathetic ownership or an incompetent front office. We could just as easily be Orlando or Sacramento where there’s little success and even less concern by NBA fans around the country. No one has an opinion on Charlotte. People don’t really concern themselves thinking about Detroit. That’s not the case here in town. Everyone has something to say about the Thunder, Westbrook, Presti or beyond. Not just to have an NBA team, no. We’re lucky the people who run the organization care enough to keep it relevant. It’s a lucky break to get a franchise, but it’s not luck the Thunder are a team everyone is talking about.